The Big News in Military Disability: The Veterans Crisis Line—Can They Really Help? You may have seen the recent reports that some calls to the VA’s Veterans Crisis Line are being put on hold, going to voicemail, or simply never being connected to a responder. According to a report from the VA’s Inspector General’s Office, approximately 1 in 6 calls in 2014 were redirected to backup centers, and even voicemail, when the crisis line got overloaded. But does this mean that the Crisis Line is useless? Absolutely not. It is completely inexcusable for even a single call to be mishandled, but do not allow these reports to discourage you from seeking the help you need and deserve. While some calls are being mishandled, the majority are not. Five out of six are connected immediately to a responder that can offer the necessary assistance. Since 2009, the Veterans Crisis Line has saved the lives of over 53,000 veterans. In a blog published by the VA last week, Gibson noted that in the last year, the Veterans Crisis Line has increased staff training with comprehensive multi-week training programs; invested in new technology, including key phone system and equipment upgrades; expanded the work area to add 45 more responder work stations; implemented staggered work shifts to provide increased coverage during peak call times; and is hiring 68 additional responders. By implementing these and other changes, the VA hopes to ensure that by the end of 2016, every crisis line caller will have their call answered promptly by an experienced responder. While the VA works to fix these important issues, please do not write off the Veterans Crisis Line. Help IS available. 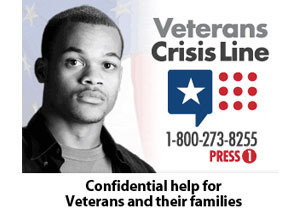 If you are a veteran in crisis or know someone who is, please call 1-800-273-8255, text 838255, or go to www.VeteransCrisisLine.net. Your life is worth saving.